Booyah Moon = Sonic Youth + Dinosaur Jr. Recently formed, coed quintet, Booyah Moon are unpolished and honest. Early this year, they released their debut album Landing, just slightly past the EP threshold at a sparse seven tracks. Landing opens with “Fraidy Cat,” a roughshod and rapid snapshot on paranoia and emotional paralysis, which seems imbued with interesting meta-messages about the modern rationale for avoidance and chronic anxiety. 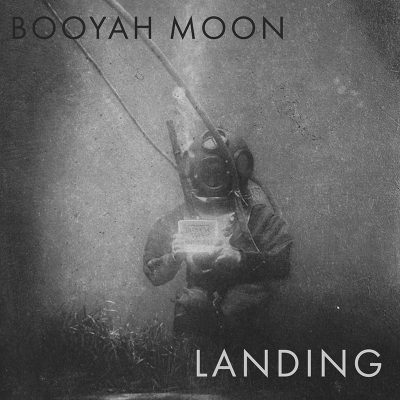 Booyah Moon practices a melodic sensibility that offsets their punky, sometimes screamo-esque vocals which seem to reflect intent and self-awareness. Landing is straightforward and stripped down, tracks are brief and direct and Booyah’s overall sound is austere. “Away for a Long Time” turns ever so slightly bluesy and folk in the spirit of Built to Spill, a method that is repeated on a few tunes in differing fashions. A disillusioned, comedic attitude takes over in track four, unravelling broken dreams and the commodification of resignation in “1-800-55D-REAM.” It’s unclear if this tune is a manifesto on capitalism and loss of identity, or a statement of resistance to abandoning one’s vision even in the face of economic and identity odds—Perhaps it is both. Either way, this track is the punkiest of the entire album and one for the slightly abashed Johhny Rotten fan in all of us. “Tin Man” detours to nearly a reggae vibe, with a juxtaposed positivity and stolid optimism, evoking a hippie-era lovefest. The inclusion of this track feels bewildering, yet clever. “Ghost” concludes Landing, with a return to the slightly dour sentiment of its sibling songs—yet with the longest runtime, an appropriate endpoint for a short, overall offering.